Being a gifted education teacher has always posed special challenges. In their first book together, two veteran educators of the gifted give teachers the information, advice, and encouragement they need. They explain how to set the foundation for a gifted program; how to evaluate, identify, and select students; how to plan and implement a range of programming options (including differentiated instruction in the regular classroom, ability grouping, pullout classes, special classes for gifted students, weighted grades, and others); and how to conduct ongoing program evaluation. 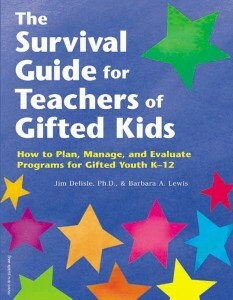 Chapters cover why and how to network and build support among parents, other teachers, and students, and how to develop survival skills needed at a time when gifted education is questioned, threatened, and underfunded. Ready-to-use reproducible forms with surveys, checklists, and a gifted program action plan—both in the book and on the accompanying CDROM.